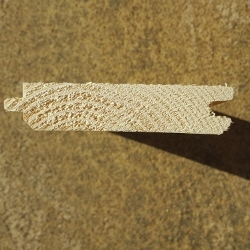 Our floor boards are 20mm thick and have a single tongue and groove profile which helps them fit together securely. At 20mm they are thick and strong enough to support the roofing material, usually roof shingles. The tongue and groove profile makes them easy to fit together on the roof and allows for the expansion and contraction of the wood in the different seasons. The underside, which will be visible inside the log cabin, has a small decorative chamfer to both edges.